The genus name Trifolium is Latin for "three leaved." The species name pratense is Latin for "found in the meadows." The common name clover derives from the Old English name for this plant, clava. Red clover is a biennial or perennial native to Eurasia, northern Africa, and North America but widely naturalized elsewhere. It features several hairy stems rising from its root and can grow to 2 feet in height. It bears three oval leaflets; a pale V shape often appears in the middle of each leaf. The flowers are pink to red and occur in sessile spikes or heads. The hermaphroditic flowers are pale pink to dark reddish purple in color. Before being pollinated they stand erect; after having been pollinated by a bee, they turn down to indicate that such attentions are no longer needed. Red clover is prevalent in the wild and can be found growing in grassy areas ranging from lawns to roadsides. It prefers full sun to partial shade and moderate amounts of water and thrives in a wide variety of soils. If wildcrafting, do not collect red clover in autumn, when they may have developed potentially toxic molds. This blood-purifying plant has a special affinity for the skin, throat, lungs, and salivary glands. Red clover cleanses and clears toxins, nourishes and moves the blood, stimulates lymphatic movement, reduces swelling and inflammation, reduces respiratory irritation, and promotes tissue repair. It contains an isoflavone, biochanin, that exhibits anticancer properties, and it is helpful in supporting all the organs of elimination, expelling phlegm from the lungs, and improving health in general. Red clover is used in the treatment of acne, arthritis, asthma, boils, blood clots, bronchitis, cancer (breast, lymphatic, or ovarian), chorea, cough, cystitis, cysts, diarrhea, dysentery, eczema, gout, heavy metal toxicity, hepatitis, infertility, laryngitis, leprosy, mastitis, measles, menopause symptoms (hot flashes, decrease in bone density), menstrual cramps, mononucleosis, phlebitis, phlegm, psoriasis, salivary gland congestion, scrofula, skin inflammation, syphilis, tuberculosis, tumors, ulcers, wheezing, and whooping cough. 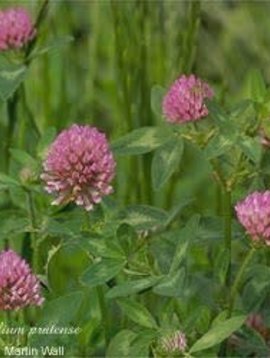 Topically, red clover can be used as a compress, poultice, or bath herb in the treatment of athlete's foot, arthritic pain, burns, cancers, eczema, gout, insect bites, lymphatic swelling, psoriasis, tumors, and wounds. It can be prepared as eyewash for conjunctivitis, as a gargle for sore throat, as a douche for vaginitis, or as an enema for bowel inflammation. The young flowers are edible raw in small amounts. Mature flowers, leaves, and roots can be eaten when cooked; cooking makes them easier to digest and less likely to cause bloating. The seeds can be sprouted and eaten. Red clover has a sweet, pleasant, honeylike flavor. Because it has a high mineral content, many vegan mothers give red clover tea to their children instead of milk. Red clover is an important fodder plant for grazing animals and, because it fixes nitrogen, can be planted as a green manure. A yellow dye can be made from the flowers. In folkloric tradition, red clover is worn to promote prosperity, love, fidelity, and protection; eating a four-leafed clover with a lover is said to result in mutual love. Red clover is not recommended for use during pregnancy, though it can be used prior to pregnancy as a fertility tonic. Avoid red clover for at least a week prior to surgery.